Sub Niall Grimley's injury-time goal rescued a precious Division Two League point for Armagh after a thrilling finish against Tyrone in Healy Park. In difficult conditions, Mickey Harte's Tyrone led for most of the game. 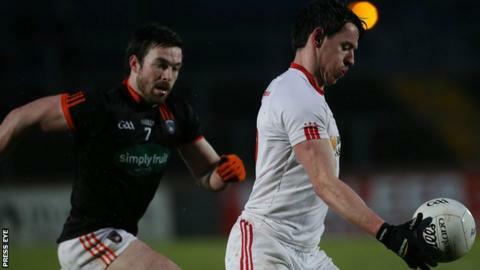 But Tony Kernan lobbed a high ball into the square in the 73rd minute and Grimley got the final touch to boost Armagh's hopes of avoiding relegation. Colm Watters was sent off late on with Stefan Campbell hitting 0-6 for Armagh and Ronan O'Neill 0-5 for Tyrone. Having conceded a last-gasp equalising goal against Galway two weeks ago, Armagh were on the right side of a dramatic finish and the point keeps their league fate in their own hands ahead of next Sunday's final game against Derry. Tyrone, already guaranteed promotion, were more clinical with their chances and led 0-8 to 0-6 at half time. But in front of 4,255 fans, the howling wind, driving rain and treacherous underfoot conditions ensured there was little to choose between the sides. Connor McAliskey hit 0-3 from play in the opening period. Armagh had a strong wind at their backs and while they hit five first-half wides, must have been reasonably happy with their 35 minutes' work. Campbell converted three frees, though missed two, while Colm Watters scored twice from play after Tyrone twice failed to secure their own kickouts. Despite failing to score from play for 45 minutes, Campbell's dead ball striking kept Armagh well in the game in the second half. Armagh were reduced to 14 men soon after when Watters was sent off for a second yellow card but Tony Kernan's spectacular point on the hour mark kept them well poised. Armagh sub Jemar Hall had a goal chance cleared off the line by Colm Cavanagh but Grimley's late heroics clinched a valuable draw.